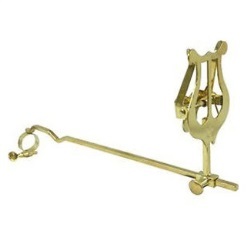 Marching lyre for tenor trombones. Attaches to mouthpiece receiver. 2-piece assembly easily and quickly adjusts via single screw for music clip. Works with most trombones. Lacquered.